100 Memorial Drive, Cambridge, Mass. 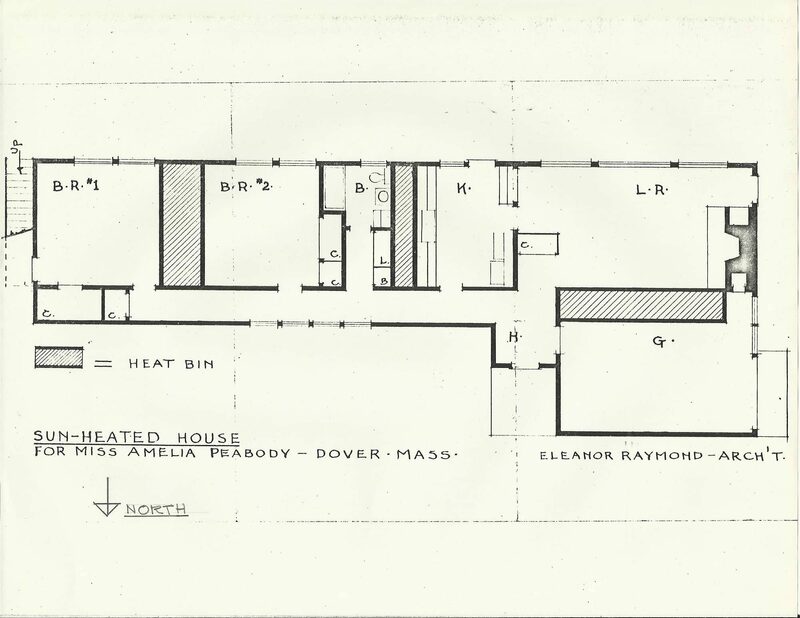 Eleanor Raymond (1887–1989) was a Massachusetts architect specializing in residential projects. 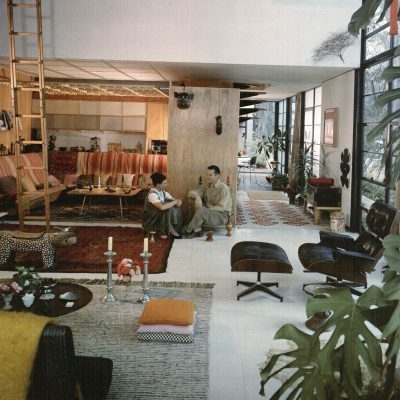 She produced a modern, multi-functional domestic architecture that remains relevant today. 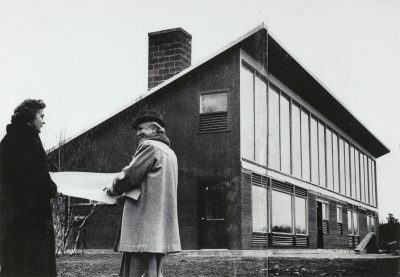 She is best known for designing one of the first solar-heated houses, the Dover Sun House, with Maria Telkes in 1948. 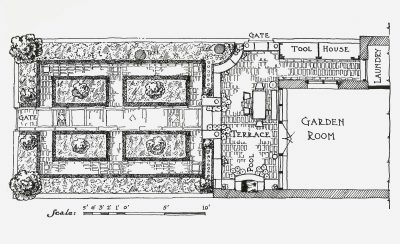 In discussing her decision to pursue architecture, Raymond remembered herself as an independent young woman with a preference for individual creative work and a growing interest in gardens and buildings. It wasn’t a very serious lecture series, but I liked him a lot and I liked his ideas. ​When that was over, I didn’t know what I could do, but I said to him, “Could I come ​down to your office and do just anything, scrub floors, just anything. I won’t ask for ​pay. I just want to be there to see what you do, drink it in.” He said, “Well, I don’t ​see how I can refuse to have you do that.” So that’s what I did. I went down to his ​office and worked there. The last thing I did was to make a drawing of stone paving ​for a terrace with different sizes of stones put together. Oh, I thought that was simply ​great.11The quotations of Eleanor Raymond included in this narrative are from an interview conducted by Doris Cole in the spring of 1981 in Cambridge, Mass. “An Interview with Eleanor Raymond” by Doris Cole appeared in Eleanor Raymond, Architectural Projects, 1919–1973 (Boston: Institute of Contemporary Art, 1981), which accompanied the Raymond exhibition at the Institute of Contemporary Art, September 15 to November 1, 1981. 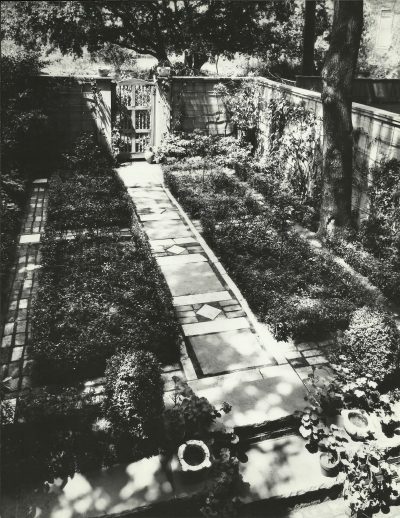 In 1917, at the age of 28 and eager to learn more about architecture, Raymond enrolled in the recently founded Cambridge School of Architecture and Landscape Architecture. The training she received there was based upon the approach of the École des Beaux-Arts,with its concentration on the classic orders. Vignola’s handbook Regola delli cinque ordini d’architettura (1562) was the guide; capital and column, cornice and frieze were the order of the day. In 1920, after completing her studies, she received a certificate rather than an academic degree, since the school had no authority to grant one. 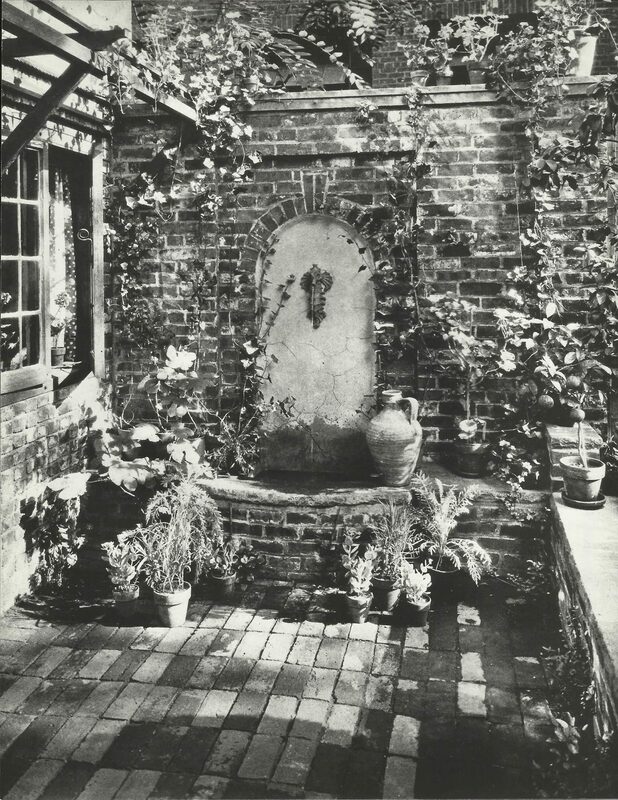 Eleanor Raymond, garden fountain, 112 Charles Street, Boston, 1923. 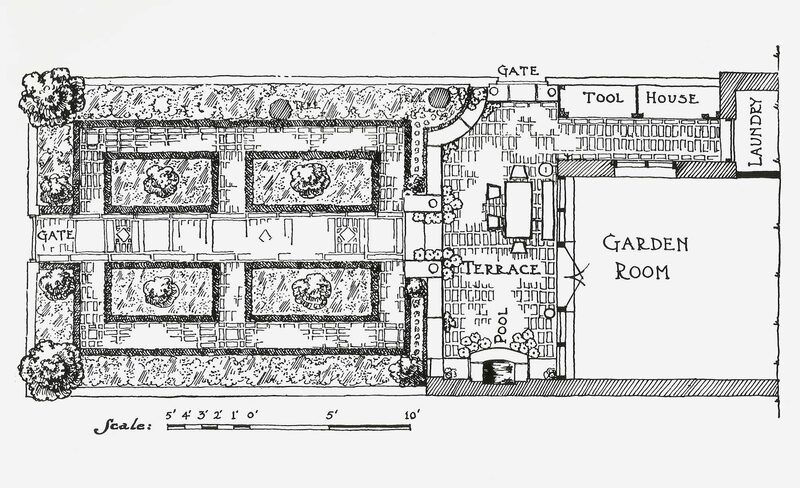 House Beautiful Magazine/Hearst Communications, Inc.
Eleanor Raymond, garden plan, 112 Charles Street, Boston, 1923. House Beautiful Magazine/Hearst Communications, Inc. Anything I see that I like and I think is worth looking at hard influences my work. I think that the people who settled Pennsylvania had a better feel for design than the people who settled Massachusetts. When doing this book, I sent down a person from my office to work and live there for about six weeks. She was Miss Ruth Crook and I trusted her sense of design. She would find the buildings and I would go down and look at what she had found and decide what to have photographed . . . . Many of these buildings were done by the Amish . . . . They gave a lot of character to that part of Pennsylvania. I’m all for simplicity and was much impressed by their buildings.33Ibid. Raymond chose to illustrate these design principles of simplicity and harmony of form in her book, and carefully studied and applied them to her own work. 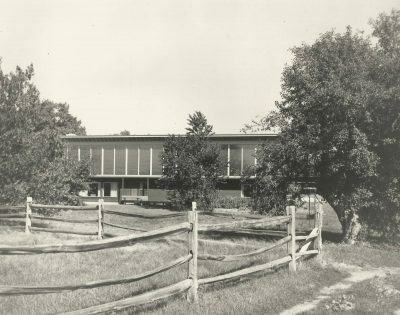 In projects as diverse as the renovation of the old Smith House and barn of 1926, the startlingly modern Raymond House of 1931, and the technically innovative Sun House of 1948, a consistency of design in Raymond’s relationship to early American architecture is evident. 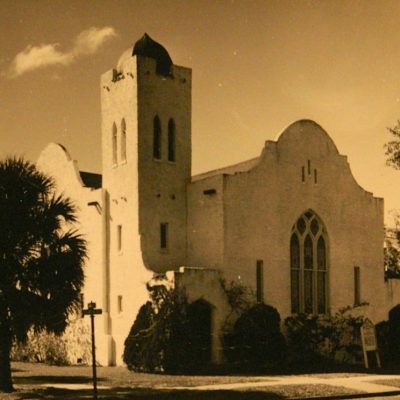 Raymond also had an ability to adapt and translate European architectural forms to a New England setting, understanding and assimilating their principles rather than simply copying their styles. 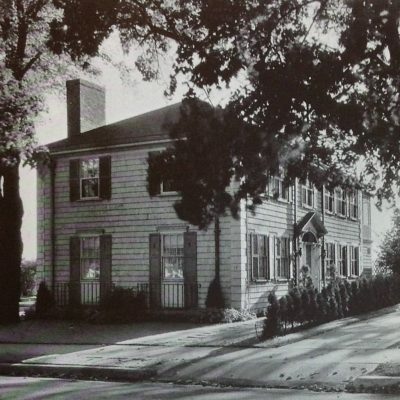 Three examples, all in Massachusetts, are the Rachel Raymond House in Belmont (1931), the Peabody Sculptor’s Studio in Dover (1933), and the extensive remodeling of the Barnes House in Haverhill (1944). In an interview in 1981, she explained her approach:44Ibid. I did it [the Raymond House in Belmont] after Ethel Power and I had come back from Europe and visited the Bauhaus . . . . When Rachel wanted to build a house, we agreed upon the International Style. What we did was to keep the style, but to do it in local, New England, materials. Over there it was all concrete or stucco, never wood. Over here wood was what we used so much. I used rough-sawn matched wood boards for the outside finish of the walls . . . . I painted the doors the orangey-red of the Barberry fruit and stained the rough wood boards a soft gray-green . . . . I had been to California and had seen cloth used to shade open places so I did that on the open terrace. I used a new kind of window—they were factory windows actually . . . . It was easy to work with my sister, Rachel . . . . 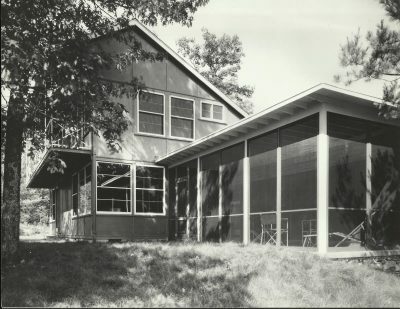 I feel as though that house is one of the best I ever did.55Ethel Power and Eleanor Raymond met at the Cambridge School of Architecture and Landscape Architecture and were lifelong friends. 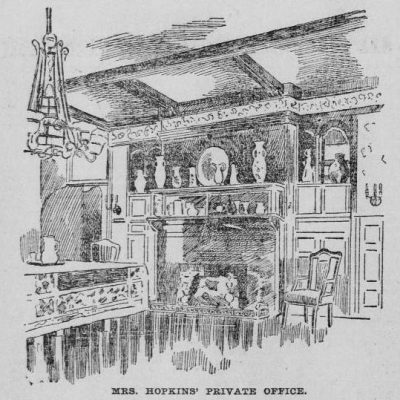 Power was an editor at House Beautiful magazine for several years in Boston and New York. Raymond also explored the use of new materials and technology. 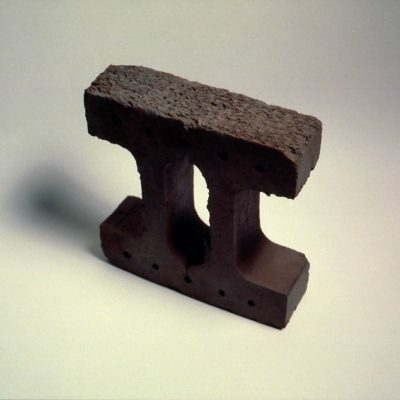 With an architectural practice spanning from 1917 into the 1980s, she witnessed tremendous changes not only in American living patterns but also in construction materials and methods. Almost immediately, she embraced new technologies and began experimenting with new materials. 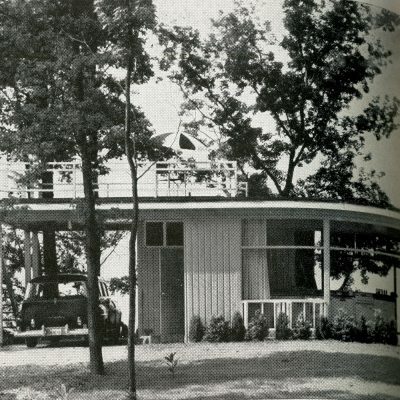 One such project was the home for Mr. and Mrs. Gordon Parker in 1941, in which she used many of the plywoods, panels, and experimental products manufactured by their company. Maria Telkes (left) and Eleanor Raymond in front of the Peabody Sun House, designed by Raymond, Dover, Mass., 1948. Everybody is interested in houses because everybody has to live in one, and also because the house that children are brought up in means so much to them all their lives. If it has a good play area . . . if the outdoors offers space allocated to swing and sand box, the child will remember that house and that childhood with pleasure all his life. Furthermore, parents will do the same if frictions related to living together are removed as far as possible.77“Eleanor Raymond ’09 Builds Houses.” Wellesley Alumnae Magazine, March 1953, 164. 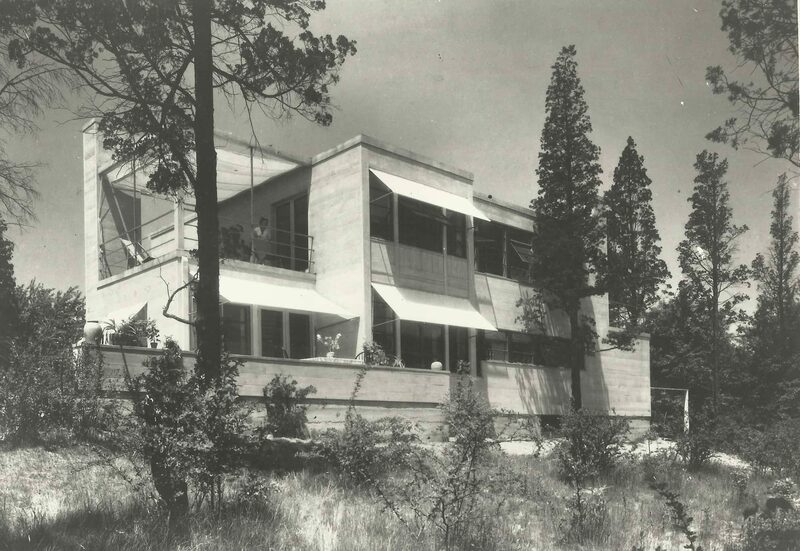 Raymond believed that domestic architecture was an important practice for young women architects. She noted that women’s traditions lie with the domestic in the broadest sense—including how people live and work, and the effect of the physical environment on everyday life. 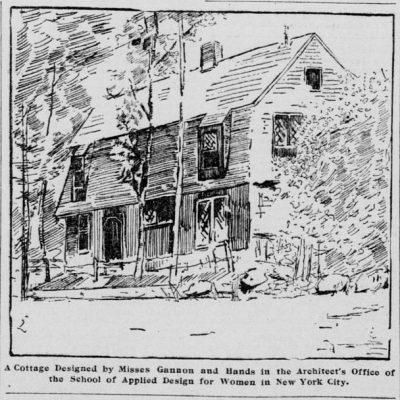 Her projects, whether houses, barns, piggeries, studios, factories, or gardens, encompassed the full range of concerns that she found essential to the built environment.88This profile is adapted from the essay “Eleanor Raymond” by Doris Cole that appeared in the book Women in American Architecture: A Historic and Contemporary Perspective, ed. 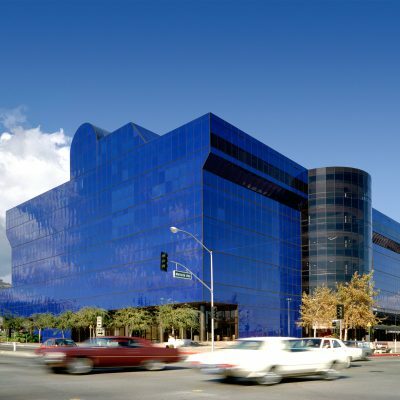 Susana Torre (New York: Whitney Library of Design and Watson-Guptill, 1977), 103–7. 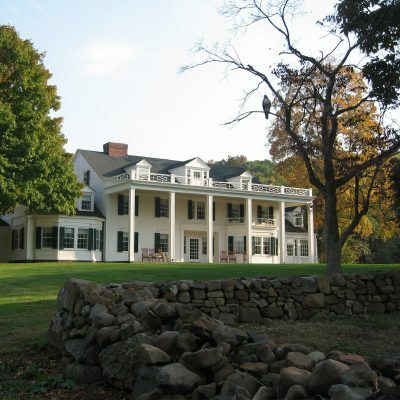 Early Domestic Architecture of Pennsylvania. Introduction by R. Bognard Okie. New York: William Helburn, 1931; Princeton, N.J. : Pyne Press, 1973. 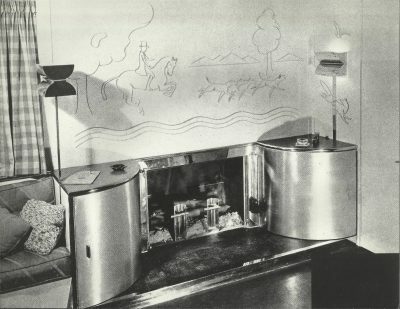 “A Model Kitchen—Designed for the Woman Who Does Her Own Work.” House Beautiful (June 1932). “Giving Character to a Nondescript House.” House Beautiful (August 1933). Allaback, Sarah. 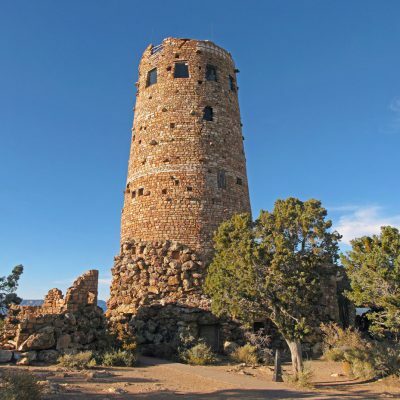 The First American Women Architects. 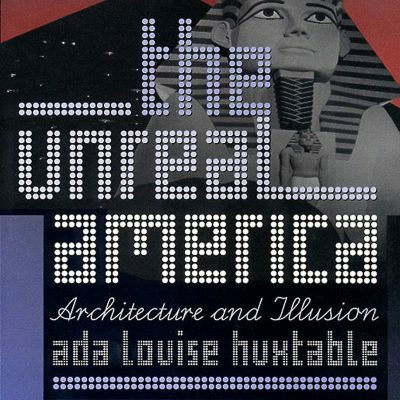 Urbana and Chicago: University ​of Illinois Press, 2008. 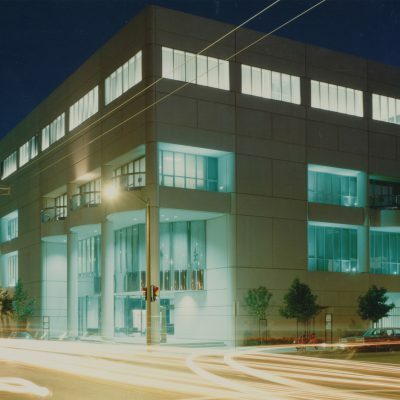 The American Institute of Architects College of Fellows History & Directory, Year 2000 ​Edition. The American Institute of Architects College of Fellows History & Directory, Year 2007 ​Edition. Anderson, Dorothy May. 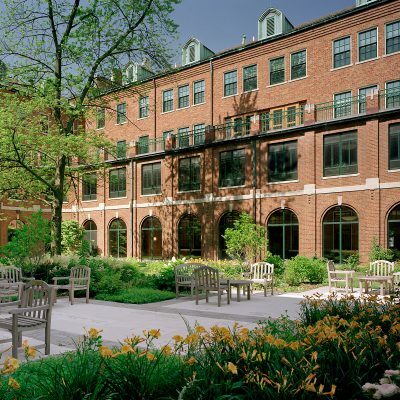 Women, Design, and The Cambridge School. 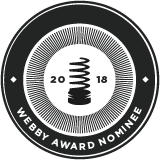 West Lafayette,​ Ind. : PDA Publishers, 1980. Barber, Daniel. 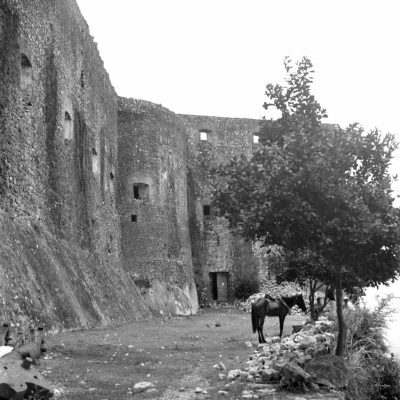 “Experimental Dwellings: Modern Architecture and Environmental Research at ​the MIT Solar Energy Fund, 1938–1963.” In A Second Modernism: MIT, Architecture, and the ‘Techno-Social’ Movement, edited by Arindam Dutta, 252–85. Cambridge, Mass. : MIT Press, 2013. ———. 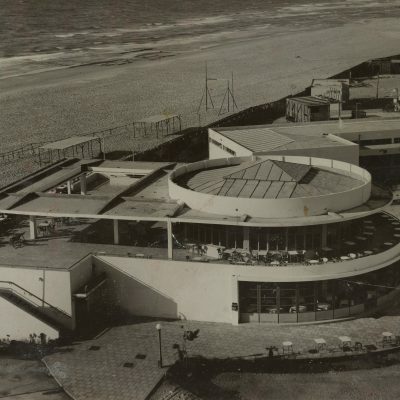 A House in the Sun: Modern Architecture and Solar Energy in the Cold War. New York: Oxford University Press, 2016. ———. “The World Solar Energy Project.” Grey Room 51 (Spring 2013): 64–93. 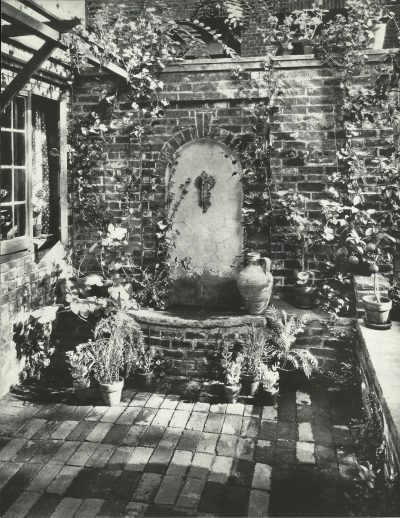 “Belmont House for T. T. Miller, E. Raymond, Architect.” Architectural Forum 72 ​(February 1941): 112–13. Berkeley, Ellen Perry, and Matilda McQuaid, eds. Architecture: A Place for Women. ​Washington, D.C.: Smithsonian Institution Press, 1989. 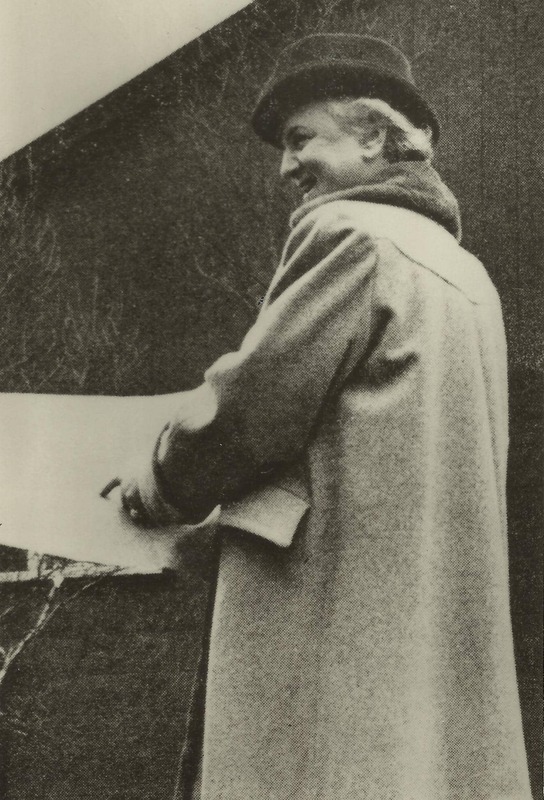 Berlo, J. C. “Women in Architecture: The Cambridge School.” Feminist Art Journal 5 ​(Spring 1976): 27–32. “Biographical Sketch.” Architectural Record 103 (March 1948): 111. Campbell, Robert. “Eleanor Raymond: Early and Indomitable.” AIA Journal 71 (January ​1982): 52–53. 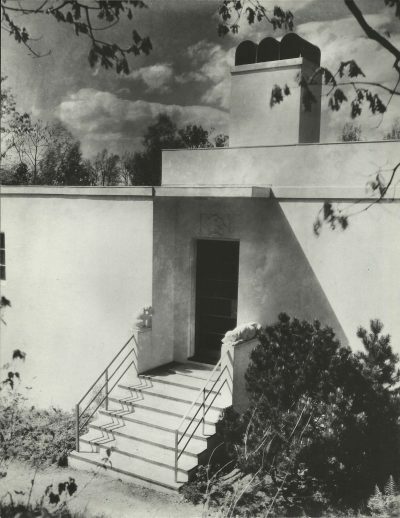 “Chestnut Hill House, E. Raymond, Architect.” Architectural Forum 72 (February 1941):​108. Cole, Doris. Candid Reflections: Letters from Women in Architecture 1972 & 2004. ​New York: Midmarch Arts Press, 2007. ———. Eleanor Raymond, Architect. East Brunswick, N.J.: Associated University​ Presses, 1981. ———. “Eleanor Raymond,” essay in Women in American Architecture: A Historic​and ​Contemporary Perspective. Edited by Susana Torre. 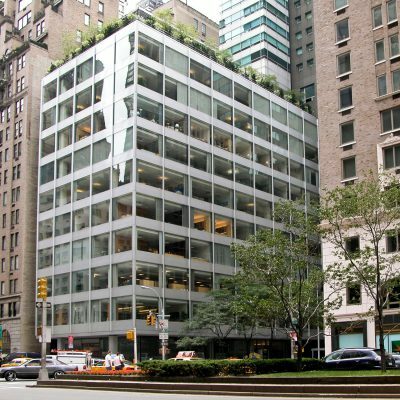 New York: Whitney Library of ​Design and Watson-Guptill, 1977. ———. From Tipi to Skyscraper: A History of Women in Architecture. Boston: i press, ​1973. ———. 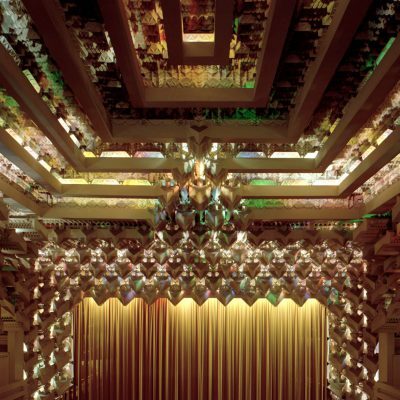 Eleanor Raymond: Architectural Projects, 1919–​1973. Catalog for exhibition, ​September 15–November 1, 1981. Boston: Institute of Contemporary Art, 1981. ———. 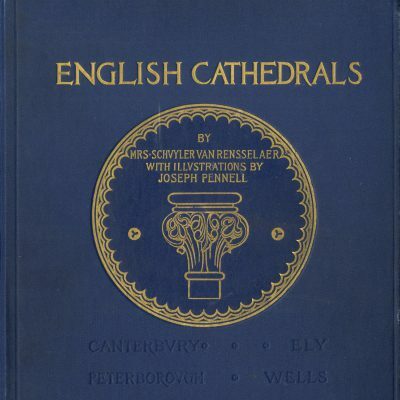 “New England Women Architects.” In Pilgrims & Pioneers: New England ​Women in the Arts, edited by Alicia Faxon and Sylvia Moore. New York: Midmarch ​Arts Press, 1987. ——— and Nick Wheeler, photographer. School Treasures: Architecture of Historic ​Boston Schools. Weston, Mass. : Font & Center Press, 2002. Denzer, Anthony. The Solar House: Pioneering Sustainable Design. New York: Rizzoli, ​2013. “Designing Women.” Newsweek, March 7, 1977, 79–80. “Duxbury House: E. Raymond and S. Pillsbury, Architects.” Architectural Forum 75 ​(December 1941): 402–3. Doumato, Lamia. 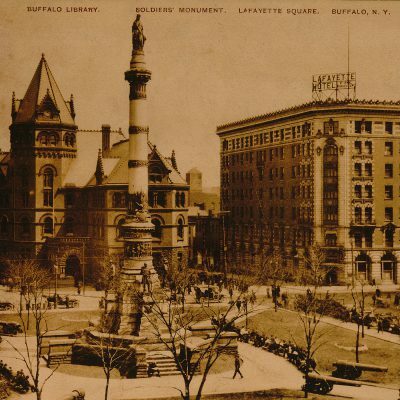 Architecture and Women: A Bibliography. New York: Garland, 1988. “Duxbury House, E. Raymond and S. Pillsbury, Architects.” Architectural Forum 75 ​(February 1941): 402–3. “Economy Still Favored Two Story Type.” Architectural Record 103 (June 1948): 103–6. 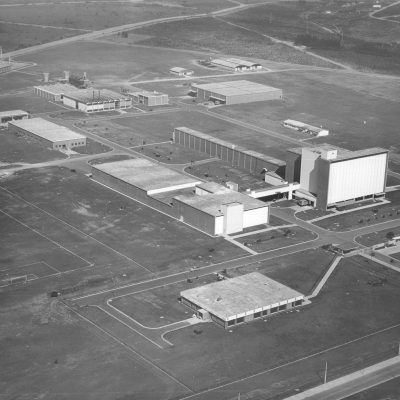 “Economy Still Favors Two Stories: Three Post War Designs.” Architectural Record 97 ​(May 1945): 96–97. “Eleanor Raymond ’09 Builds Houses.” Wellesley Alumni Magazine, March 1953, 164. Frost, Henry A., and William R. Sears. 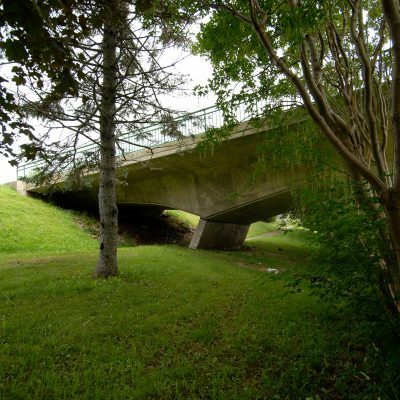 Women in Architecture and Landscape​ Architecture. Institute for the Coordination of Women’s Interests, Publication no. 7. ​Northampton, Mass. : Smith College, 1928. Greely, Rose. “An Architect’s Garden in the City.” House Beautiful, November 1926, ​557. ———. “A Small House of Distinction.” House Beautiful, November 1922, 423. Gruskin, Nancy Beth. “Building Context: The Personal and Professional Life of Eleanor ​Raymond, Architect, 1887–1989.” Ph.D. dissertation, Boston University, 1998. 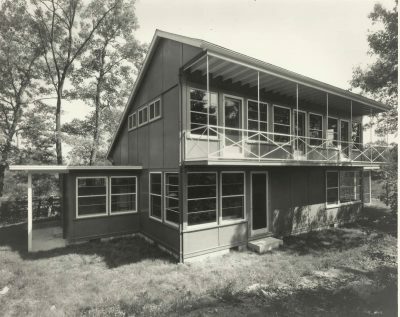 “Haddam Remodeled House of Mrs. D. R. Ellis; Haverhill Remodeled House of R. ​Barnes, E. Raymond Architect.” Architectural Record 76 (October 1934): 298–304. 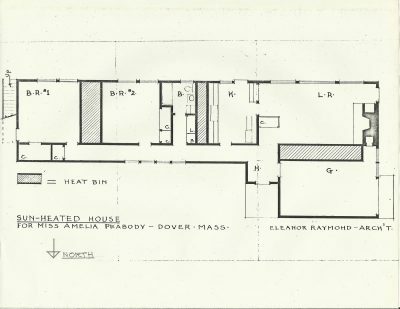 “House for James H. Cleaves, Winchester, Massachusetts.” Architectural Record 66 ​(November 1929): 442–43. 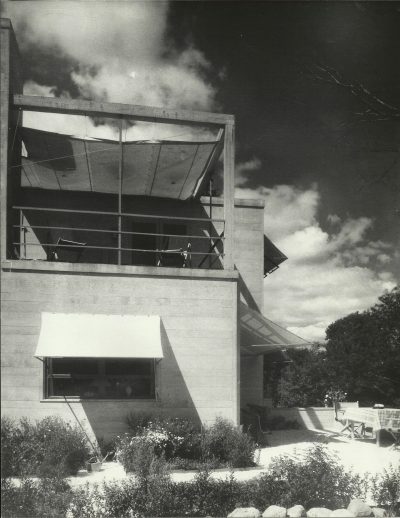 “House in Weston, Massachusetts.” Architectural Forum 79 (November 1943): 82–83. 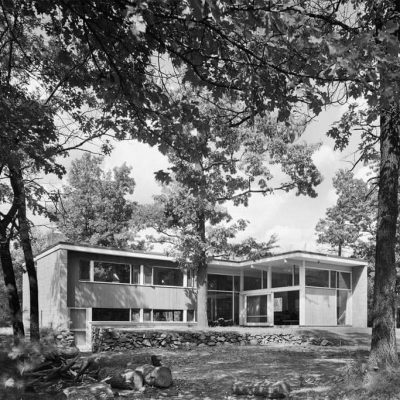 “House in Winchester, Massachusetts.” Architectural Record 103 (June 1948): 103–5. “House of James H. Cleaves, Esq., Winchester, Massachusetts.” Architectural Forum​ (January 1927): 95–96. Kingsbury, Edith. “Spring Pasture—Our Experiment in the Country.” House Beautiful,​ October 1932. “Lattice Trimmed.” House Beautiful Building Manual, Spring 1940. Mitchell, Marguerite MacKellar. 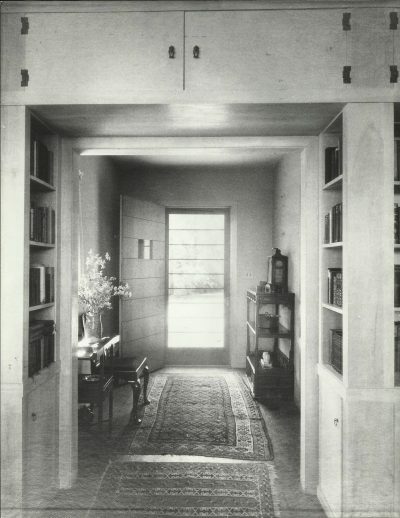 “Barn into Studio.” House Beautiful, September 1933. Murphy, Kevin. “The Vernacular Moment: Eleanor Raymond, Walter Gropius and New ​England Modernism before the Wars.” JSAH 70, no. 3 (September 2011): 308–29. 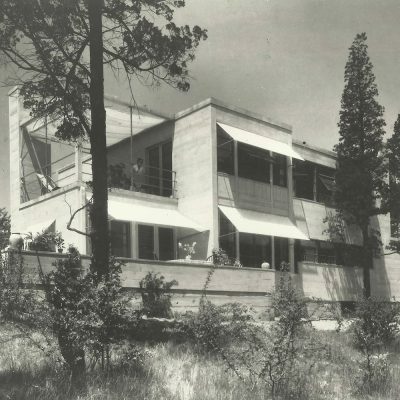 “Newton Center House with Office, E. Raymond Architect.” Architectural Forum 74 ​(May 1941): 356. Power, Ethel B. 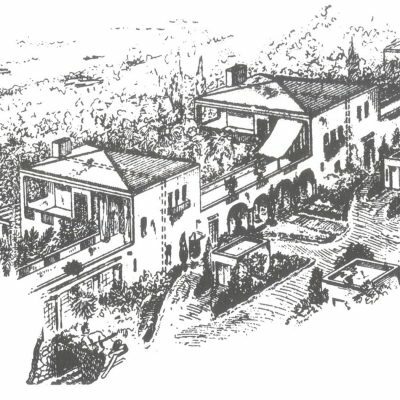 “A Beacon Hill Renovation.” House Beautiful, November 1924. ———. “High Spruces.” House Beautiful, March 1932. ———. The Smaller American House. Boston: Little, Brown, 1927. 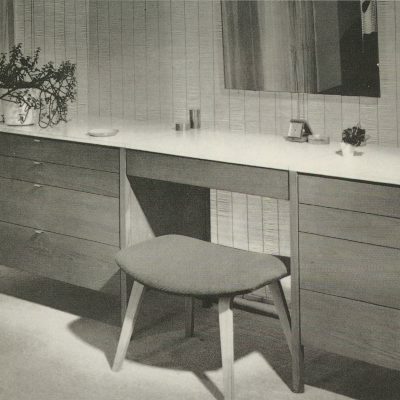 “Remodeled House of Frank Barnes, Haverhill, Massachusetts.” Architectural Record 76 ​(October 1934): 300–2. Scherburne, Morgan. “The House of the Day After Tomorrow.” MIT Technology Review,​ June 22, 2010. 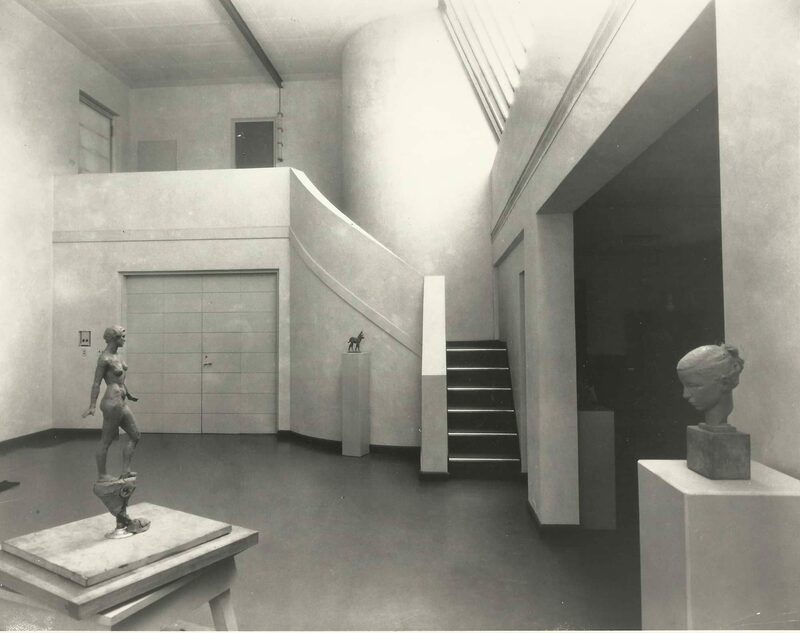 “Sculptor’s Studio, Dover, Massachusetts, E. Raymond Architect.” Architectural Forum​ 67 (July 1937): 36–37. “Small and Medium Cost Houses.” Architectural Record 74 (August 1933): 121–41. Smith, Mary B. 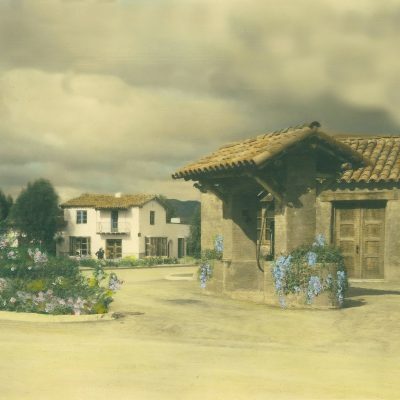 “Two Houses from One.” House Beautiful, September 1928. 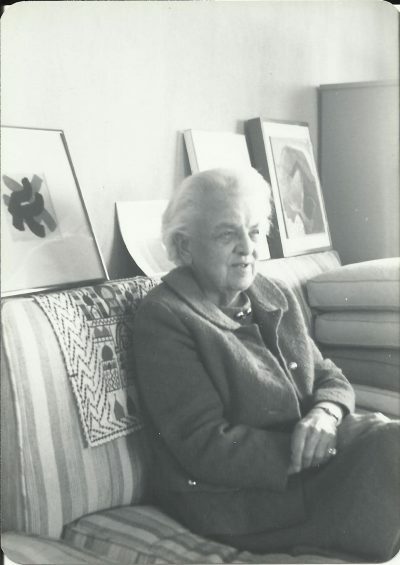 Soo, Lydia M. “Eleanor Raymond, Architect.” JSAH 63 (March 1984): 89–90. 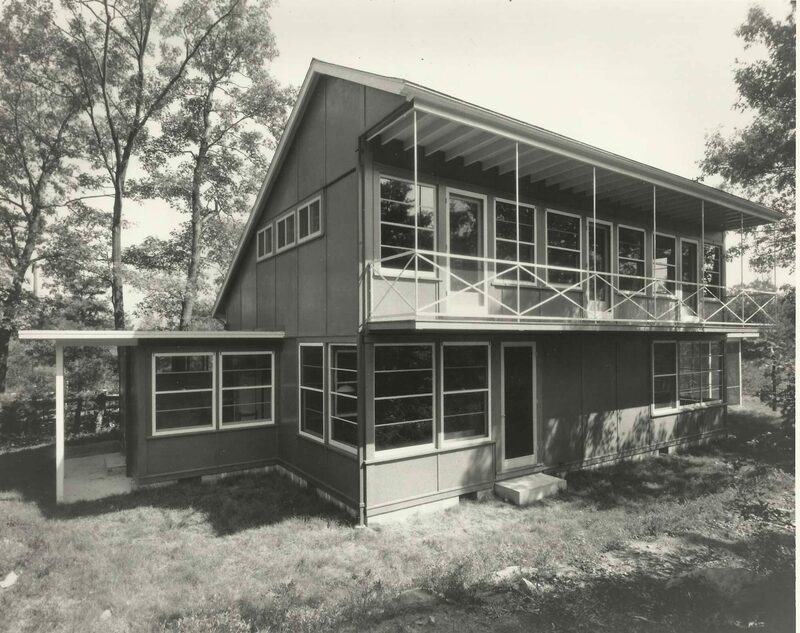 “A Suburban House, Milton, Massachusetts.” Architectural Record 72 (November 1932): ​316–17. Taylor, Jerry. 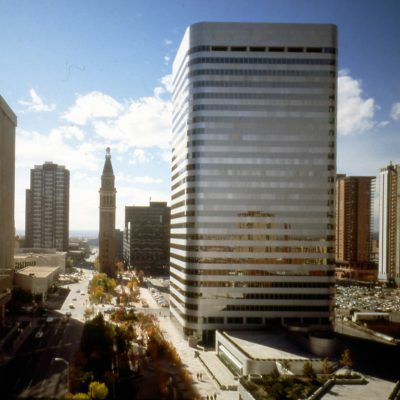 “Eleanor Raymond, 102; Architect, Designed First N.E. Solar House.” ​Boston Globe, July 28, 1989. “Test House Heated Only by Solar Heat.” Architectural Record 105 (March 1949): 136–​37. “A Thousand Women in Architecture: I.” Architectural Record 103 (March 1948): 111. Vare, Ethile Ann, and Greg Ptacek. Mothers of Invention. New York: William Morrow, ​1988. “Weekend Residence of R. L. Pope, Smith’s Point, Manchester-by-the-Sea, ​Massachusetts.” Architectural Record 113 (January 1953): 137–39. 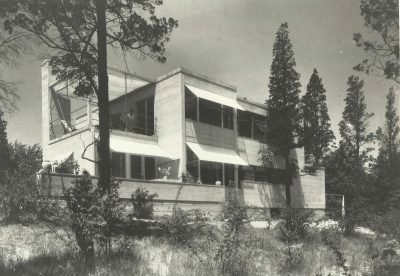 “Weston House.” Architectural Forum 79 (November 1943): 82–83. “Women in Architecture: The New Professional, Coming of Age.” Progressive ​Architecture 58 (March 1977): 47. Wright, Gwendolyn. 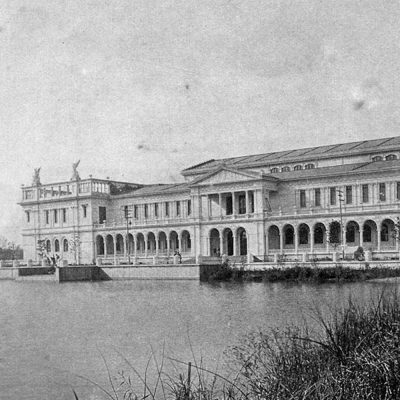 “On the Fringe of the Profession: Women in American ​Architecture.” In The Architect: Chapters in the History of the Profession, edited by ​Spiro Kostof. New York: Oxford University Press, 1977.